Every spring I look forward to the Bleeding Heart plants that sprout up around the edges of the yard. 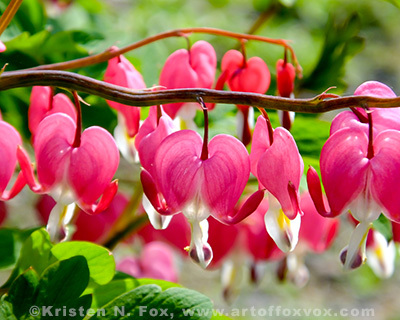 They’re odd little creations – heart-shaped flowers dangling down from their horizontal plant stalks – but are pretty prevalent in this area. Thanks to the early morning light, I was able to capture a really vibrant shot!